In a recent guest blog post, Quanzhi Ye pointed to the Chinese version of the Planetary Data System, and shared the great news that Chang'e 3 lander data are now public. The website is a little bit difficult to use, but last week I managed to download all of the data from two of the cameras -- a total of 35 Gigabytes of data! -- and I've spent the subsequent week figuring out what's there and how to handle it. 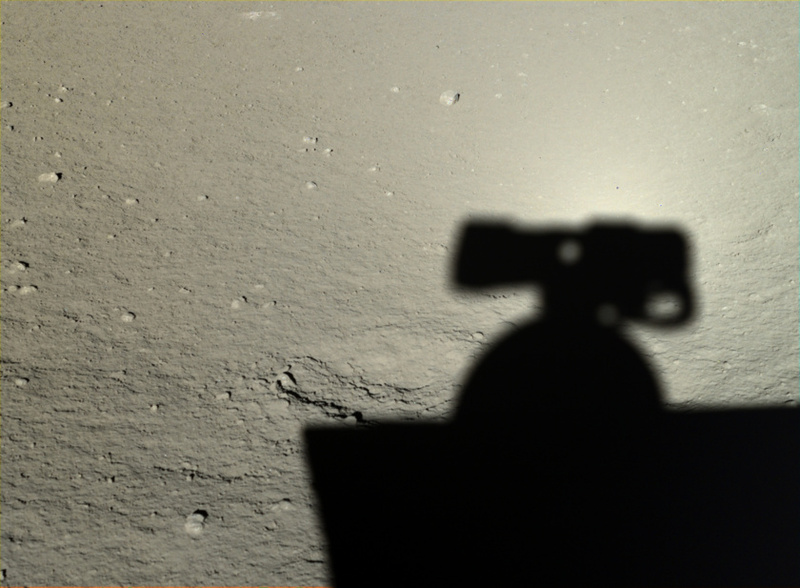 So, space fans, without further ado, here, for the first time in a format easily accessible to the public, are hundreds and hundreds of science-quality images from the Chang'e 3 lander and Yutu rover. I don't usually host entire data sets (PDS-formatted and all) but I made an exception in this case because the Chinese website is a bit challenging to use. And here are just a few of the goodies contained therein. You may want to keep Phil Stooke's landing site map and Yutu route map handy for reference as you look through these! 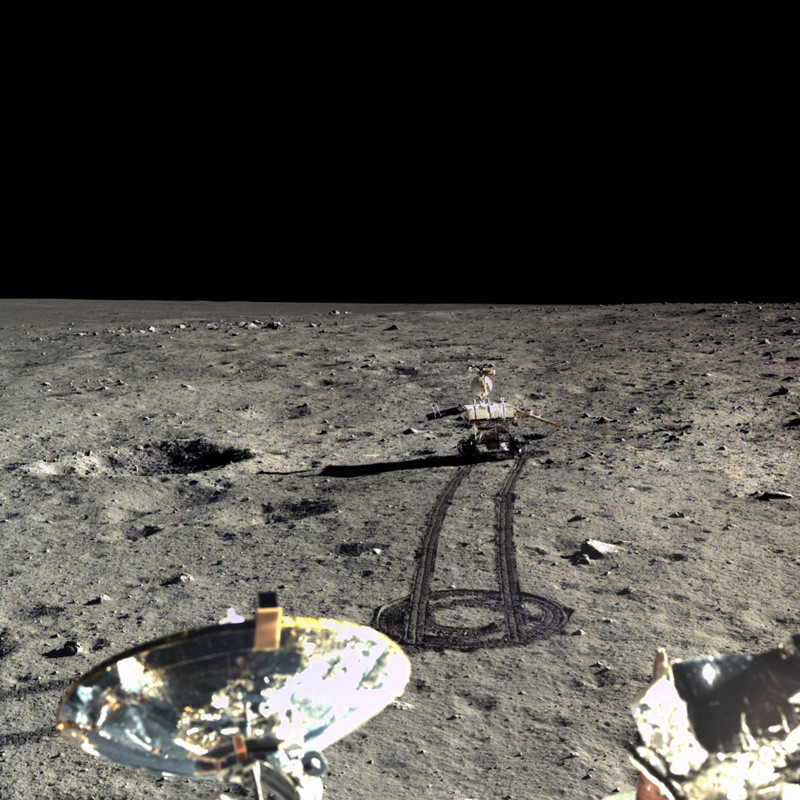 The Chang'e 3 lander captured the four images for this mosaic of the Yutu rover driving southward on December 23, 2013. Yutu's right solar panel is angled downward to catch the glancing sunlight at a better angle. Two images of Yutu captured by the Chang'e3 lander on December 22, 2013. Yutu took this photo of its own shadow on January 12, 2014. 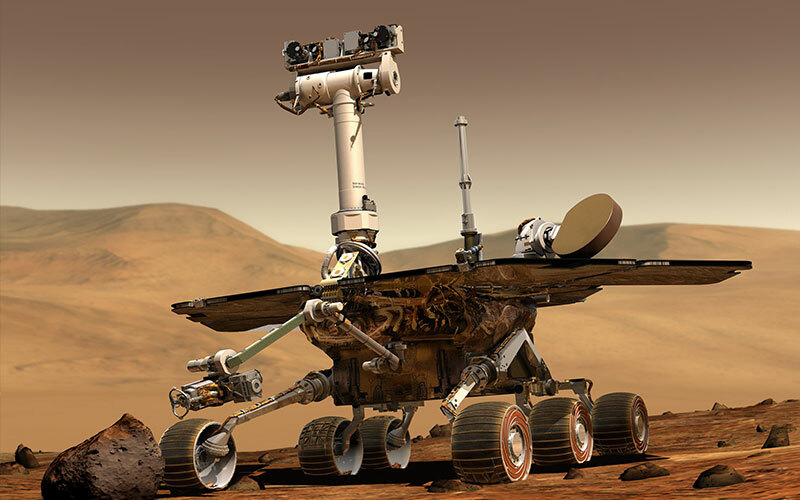 A halo appears around the right side of the rover's head because in that area, with the Sun precisely behind the right-eye camera, there are no visible shadows. 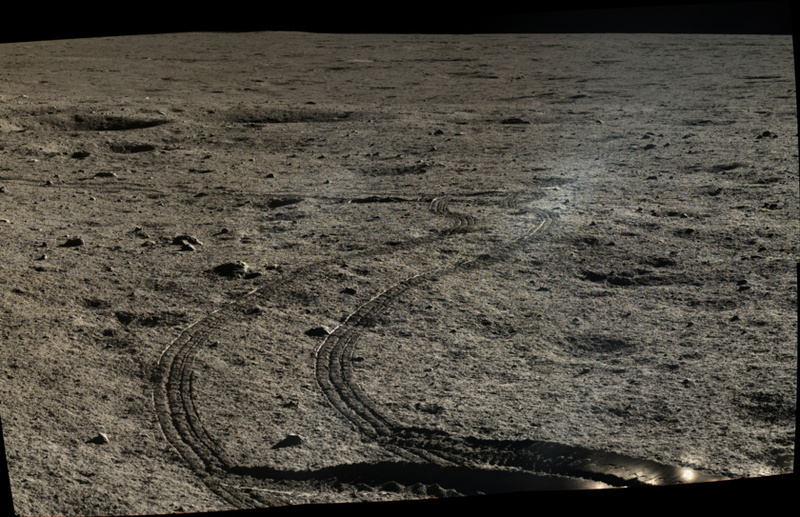 Part of a full 360-degree panorama taken by the Chang'e 3 lander on December 17, 2013, three days after landing. 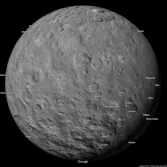 To the left is a crater nearly 20 meters in diameter whose rim features large blocks of bright rock. Yutu's wheels carved curved tracks in the lunar soil. The images for this mosaic were taken on January 12, 2014. This is a mosaic of six images captured by the Yutu rover on January 13, 2014, after it had driven southwest of the lander to visit a large block of impact ejecta that the team named Long Yan (Pyramid Rock). 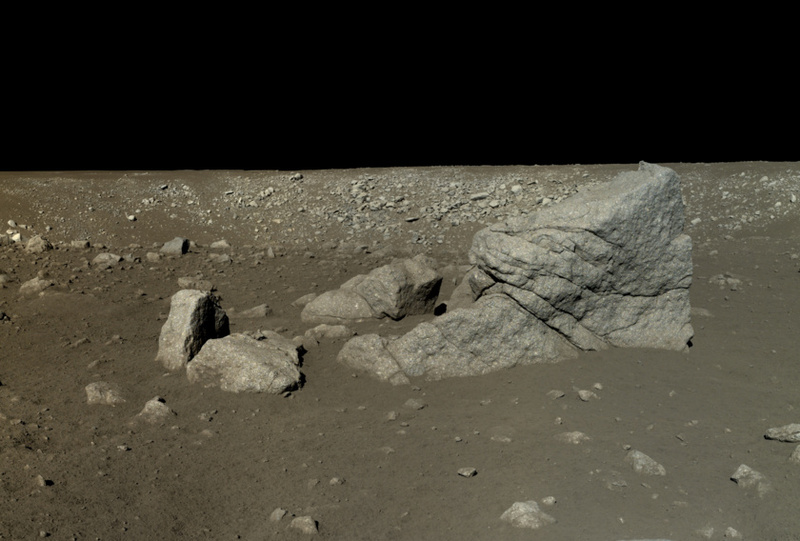 The Yutu rover took the images for this panorama on January 13, 2014, during the rover's second lunar day on the surface, while close to "Pyramid Rock." Two Earth days later, the rover's motor unit failed, after it had driven substantially closer to the lander. I think that last one is my favorite. These are not the only two image data sets available, but they were all I was able to download last week, and the website has not worked at all for me this week; you need to log in to download data, and the login function is not working. But I'll keep trying. The next one I'm going to try to grab is the descent camera data set. There are also ultraviolet telescope data. As far as I can tell, there are no engineering camera data available, unfortunately, so there is not much in the way of animateable imagery just yet. I know from publications by the Chang'e 3 team (like this one, which is a gzipped PDF file) that neither of these two data sets is complete. Both were first used the day after landing, with the first TCAM image at 11:01:38 and the first PCAM image at 12:44:50 UT on December 15, 2013. From then to March 17, 2014, PCAM obtained a total of 780 photos, operating over a total of four lunar days. TCAM, on the other hand, failed over the first lunar night; I don't know how many photos it took, in total. 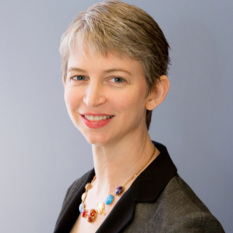 So far, the data center contains 797 unique observations from TCAM, and 578 for PCAM. For both cameras, both the earliest and the last image data are not yet in the public archive. In particular, the initial PCAM 6-frame mosaic of the lander is not in the database, and the final TCAM images of Earth are also not in the database. So there are more goodies to look forward to. Some facts about the cameras: the two camera systems are very similar. TCAM consists of a single camera, while PCAM is a stereo pair separated by 27.0 centimeters. They both have CMOS detectors, 2352 by 1728 pixels in size, with Bayer filter arrays for color. The PCAM field of view is 19.7 by 14.5 degrees. The PCAMs were sometimes used in a "panchromatic" mode, in which the images were downsampled by a factor of 2 before download, which also removes color information. Most of the observations are available as both grayscale versions (which haven't been demosaiced to turn them into color), and as color versions. The color in the PCAM images is fairly consistent, but I get weird results with some of the TCAM images. I'm looking forward to seeing what other folks produce with these data sets. In particular, there is a lot of fun to be had with the stereo capability of the rover PCAM, which I didn't begin to play with. Hi, nice work, at last, the pictures are of source quality and not the downsampled and distorted from presentations and TV. I have problems viewing the detail of the panorama in both Firefox (nothing) and IE(picture only during downloading, then nothing again). I tried downloading quite a few of the pictures in each data set using Internet Explorer 11 and I had no problem at all. Thanks Emily for access to the great pictures. I am glad the Chinese have a vision for visiting the surface of the Moon but I hope the US and NASA after the end of Obama's presidency will launch efforts for robotic landings or rovers on the Moon and revise the Space Launch System and Orion to allow for astronauts to land on and set up a long-term manned base on the Moon and eventually on Mars. Landing at six places on the Moon is like landing on only six isolated locations for a couple days each on the area of Asia or the Americas on Earth that each have about the same area as the Moon. This does not mean been there done that. Emily Great work. Thanks for sharing. @Tomas: It's possible your browsers don't like how large the images are. Try downloading them to your desktop and then opening them there. Where are the stars? The moon is airless and the "sky" should be full of stars. So, why is it pitch black? there is the posibility that the vehicle is located inside the big moon crater Mare lmbrium and for that reason there is no view of the stars due the angle of which the picture was taken. @Harlech: Stars are very faint and the camera's exposure was very short because this was shot during the day. The stars won't show without a much longer exposure which would wash out everything on the surface. @Sisan Perhaps because they used the same studio set that NASA did for the Apollo missions? Jocularity aside, there are no stars visible due to limitations with current photographic technology. Cameras are simply not sensitive enough to register stars when there are very bright subjects in the field of view. Cameras automatically adjust exposure and/or aperture to avoid overexposure and thus loss of detail in the subject. Consider: If the exposure were long enough for the CCD to register the faint trickle of photons from stars, then the portion of the CCD on which the image of the primary subject is projected will just register white from the flood of photons pouring into that area. In fact, for the CCD to registers stars in the daytime with a brightly like primary subject, the exposure will likely have to be long enough for the CCD to overload completely from the light reflecting off the subject, leading to CCD "blooming", which would basically wipe out any useful data in the image. Of course, it should be possible to create CCDs with "smart pixels" that can, through some software wizardry, identify if they are in a dark or brightly lit portion of the image being recorded, and individually "adjust their exposure" by recording their charge at some optimal point. Such a CCD would be dramatically more complex that current devices, though, and would complicate image processing, and what's the point besides showing the stars in a brightly lit scene? The same cameras on Yutu can record stars on the Moon simply by being turned away from brightly lit objects and increasing the exposure time, and I wouldn't be surprised if there were a few such images in the data. The one picture of the rock formation still shows shadow irregularities. One little spot looks almost blacked out. This was another reason truthers doubted the US landing. Sure was kept quiet. Why do some of the images have a green "lens flare" in them? I'm sure there's a good scientific explanation and it would be good to have when dealing with alien kooks, Moon landing deniers and the like. Pyramid Rock looks very weathered to me. It looks exactly like what a terrestrial rock looks like that has weathered. I realise that the heat from the impact might account for some of the round edges, maybe even for the weathered ‘orange peel’ texture of the faces of the rock. But the rounded edges of the cracks in the rock? Will those cracks have formed like that during the impact, rounded edges and all? Can anyone explain in detail how the ‘weathered’ look of the rock might have come about? There are no stars because it's "day", the sun is up. Although there is no atmosphere to scatter the light and make the sky appear blue, there is actually LOTS of light. The surface of the moon is VERY reflective. So the exposure length that makes for a good picture of the surface and the spacecraft is way too short to see the stars. If you did a longer exposure, the surface would look overexposed. Does the spacecraft actually have color cameras? Or is it taking multiple grey scale images through different filters? 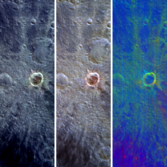 The latter is more common on spacecraft, because they can then carry a bunch of different filters and the different pictures for different purposes. The full color panoramas are "fun", but the real science takes place by taking pictures in different spectra. You can learn far more about what stuff is made out of by doing that than your can from a "true color" image. Having said that, the true color images are amazing. Time to compete less, cooperate more, partner up with China and other countries and establish a permanent presence on the Moon and beyond. @Alex: There are some very colorful lens flares in this data set, a result of looking relatively close to the Sun causing stray light to bounce around inside the optics. Here's a special favorite: https://planetary.s3.amazonaws.com/data/change3/tcam/png/TCAM-I-042_SCI_P_20131224171912_0011_A_2C.png @NeilV: The Moon goes through enormous temperature extremes; day/night cycling of temperature in the rock is what makes it break up like that, with some help from micrometeorite impacts. @mgkaiser: Like the Mastcams on Curiosity, the PCAM and TCAM instruments are color cameras with Bayer filter arrays on CMOS detectors. If you follow the links at the top of the page to the raw data, you will find grayscale versions (which have not been demosaiced to color, so show the Bayer color pattern) along with the color versions. 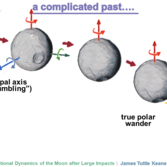 @NeilV: I'm not an expert but without an atmosphere to protect the moon from cosmic rays, wouldnt eons of exposure potentially explain weathering of surface stones? @DaltonWest: I'm no expert, but it seems likely that the black spot, which is pretty close to the center, is an artifact caused by the process of compositing the 6 photos that were merged to form the one big picture you see here. Just a guess. Are there any pictures (from this Chinese mission) of artifacts left by any prior moon missions? Too short an exposure for the stars yes, but I'd think Venus at least would be very bright and be detectable, and perhaps other planets. The camera can be in manual or auto exposure mode, and long exposures are possible, so why not do some astrophotography while the lander is in the dark for a couple of weeks? I guess you'd have to ask the Chinese about that. Hmm. The Chinese lander looks remarkably like the American Lunar Module decent stage. And there is no blast crater under the Chinese lander. And there are no stars in the lunar sky in the Chinese pictures. And the shadows in the Chinese pictures look similar to the shadows in the Apollo pictures. Looks like NASA didn't fake the moon landings after all. 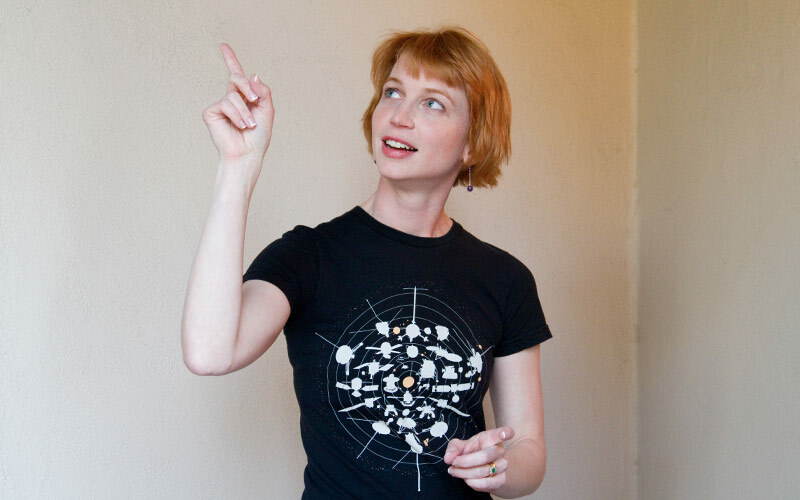 @ randywade - You wouldn't expect any pictures of artifacts from any prior moon missions. The closest Apollo landing was hundreds of miles away. The skies in these photographs are all pure-black (RGB 0,0,0). I hear what everyone is saying with exposure, etc, and that's correct. However, limiting exposure would not result in PURE 100% lack of ANY color detail all the way down to ZERO information. Out of 16.7M colors, there are a TON of colors that are visible black, but not PURE 100% black. Save a local copy of these photos and analyze the pixels in Photoshop. EVERY pixel in the sky is RGB 0,0,0. The sky was air-brushed black, 100%. @Dave Think about what is actually going on in the camera. With a very bright subject, the effective exposure time for the CCD is likely about 1/1,000 of a second. The stream of photons being collected by a 50mm lens (I'm guessing on the lens size, but I doubt it is dramatically bigger than that) from a typical star will not likely be much more than a thousand or so per second. This means that in our exposure interval perhaps a single photon interacts with the CCD, but that is assuming 100% efficiency in our camera optics and electronics, which is nonsense. We would be lucky if the camera has a net efficiency of 50%, and that is only assuming it was specifically designed to work with very dim subjects, and since Yutu is designed to work in daylight (it is solar powered, you know), what would be the point in that? There are too few cloudy days on the Moon. We are now at about a 50/50 chance of a single photon from a typical star interacting with the camera's CCD. Now tack on the fact that they are using Bayer filters to produce a color image, so that photon needs to be the correct "color" to make it through the filter before it reaches the CCD itself. That introduces a 1 in 3 probability for our photon, for a rough total of 1/6 chance of the CCD getting even a single photon from a typical naked eye visible star during the exposure period. As you can see, the odds are against even a single photon from a typical star interacting with out camera's CCD, and even fairly bright stars will only get a couple photons through that gauntlet. When you consider that any particular pixel in the CCD will saturate and register pure white at somewhere between 50,000 and 100,000 photons, then perhaps you can understand why the camera electronics will treat data from pixels that have only collected one or two photons as noise and filter them out. Designing the camera to register such tiny charges would either reduce the camera's dynamic range or require ridiculous bit depth. Fake or not.. you CONNOT see stars when on the bright side of the moon. Soace is black yes, but VERY bright. The sun is still there, and the light has nothing to bounce off so no reflection = no colour. Also with that bright thermo-nuclear reaction going on substantially closer than the next nearest one, you will not see the others as there is too much light already in place. TEST: shine a bright torch in your eye line late one night in a dark field, now ask someone 100m away to switch on a singular LED... you wont see it as your vision is already flooded with light. Because space is black, does not mean there is an absence of light. You would see stars on the 'dark side' of the moon, but as the moon keeps its spin axis in lock facing the earth with its orbit, it would need to cover some distance to get to the other side. I'm not saying this photo isn't a fake, but to expect to see stars in these images... use your heads!! If you COULD see stars, and they wanted to fake the image... THEY WOULD PUT FAKE STARS IN!!! And for you blast crater lovers... the module has landed on solid rock! yes, there is a layer of dust, but it's not like earth and has soil. It's not landing on a sandy beach.. it's a big old rock. Again, not saying there is no conpiracy, but just use your heads a little?? © 2017 The Planetary Society. All rights reserved.